This was quite a surprise and honor to be chosen as a co-host to Handmade Wednesday Store & Blog hop ... please be sure to stop by, comment and follow our wonderful blog hosts and participants! I had some organza ribbons and a few round beads left and I sifted thru a magazine and saw a pavé bracelet with white beads and black focal...so my "aha" moment occurred. 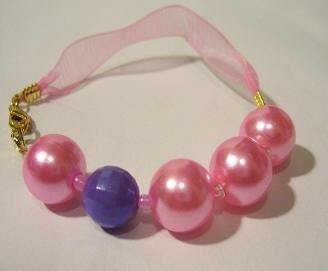 I weaved round pink plastic beads with a single purple focal bead and added a gold figure -8 connector finishing of with a gold lobster clasp for an easy closure. This is a cute piece to wear for any pastel or casual wardrobe. There's only one available and less than $15! You can purchase this at either one of my shops...Etsy, or Simply Shop|323 home page. Kabibe Shell? What is that? Kabibe? What is it you ask? Well, the first time I saw the word myself I had no idea what it meant or even was. So what do we naturally do when we're curious about something? "Google it!" right? The word Kabibe is also a name of a place: Mahiwagang Kabibe (Magical Clam) which is a location for one Filipino comic book character. So, when I found this Kabibe Shell Pendant and added pastel cracked beads to it, the outcome matches the vast orgin of the word. It's unique that would pleasantly adorn any Little Lady who's just as unique as the name! Visit anyone of my shops on the Shop Here tab to purchase it! Great Graduation gift for your special graduate!